If there is one thing horses love—and absolutely need—it is a natural salt lick. However, many salt licks that horse lovers find on the market are incredibly expensive, heavy, have been baked to lose all minerals and nutrients, or simply can be too easily bitten. The wonderful thing about Himalayan natural salt licks that have been mined from some of the best mines in the foothills of the Himalayas is that they are rock solid. It takes incredible miner strength and special tools to wrench these solid rocks of healthy salt from the earth—and no horse can chew through these bricks. Natural Salt Licks play a significant role as simple and cost-effective mineral supplement for pets and breeding animals, as well as wildlife. The animal helps itself to the salt lick instinctively according to its individual need.Natural Salt Licks are available in different sizes, pure or fortified with minerals and trace elements as well as in different flavors. The purest form of salt you can give your horse. Natural and as pure as the day it was mined high up in the Himalayan mountains. Horses and ponies require supplementary salt on a daily basis. Research shows that salt is the one nutrient that horses will self-supplement to balance their diet. Himalayan Natural Salt Licks hung in the stable and field allow access to the purest form of salt, without unnatural flavors that can encourage greediness! 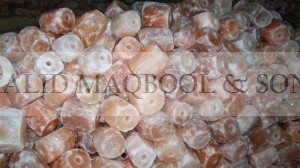 Mass produced natural salt licks are produced using salt with minerals added in the manufacturing process. Himalayan natural salt licks are literally ‘rock hard’, this means that animals are unable to bite chunks off the block, a problem that can occur with the softer pressed natural salt lick.These salt licks are also much more weather resistant, which means they can be safely left outside in the field for farm animals to self dose. Our experience has shown that farm animals and pets prefer these to other salt licks. Farmers have historically provided natural salt licks for their cattle, horses, and other herbivores to encourage healthy growth and development. A natural salt lick is a deposit of mineral salts used by animals to supplement their nutrition, ensuring that they get enough minerals in their diets. A wide assortment of animals, primarily herbivores, use salt lick to get essential nutrients lick calcium, magnesium, sodium and zinc. Himalayan natural Salt Licks for farm animals are obviously distinctive by their color, however it is not just this that sets them apart from other licks. We like to describe them as salt licks with nothing added or nothing taken out and we believe they are one of the purest forms of salt (sodium chloride) available. • Crafted from 250 million year-old natural salt mines in Khewra (Himalaya). • Long-lasting for horses, livestock and other pets to enjoy for hours on end. • They are rock hard, so horses, livestock and other pets cannot bite pieces out of them. • Each salt lick comes ready to hang with a handy rope. Hang one undercover at a gate, fence, trough, tree, stall, stable or trailer. • These Himalayan natural salt licks make the perfect unique gift for animal lovers. Without salt, animals could get sick. Every mammal requires salt. It is actually a necessary nutrient in our diets! Horses and other animals, like humans, lose minerals from their bodies as it is carried out in their sweat…one of the most abundant of these minerals is salt…Horses and other animals often lose lots of salt during very strenuous workouts. So, some owners try to help them replenish the lost salt by providing a natural salt lick. This helps your horse or animal to regain the lost salt quickly, however there are more reasons. Salt often makes you want to drink, right, so, it’s similar for horses. Healthy Blood Sugar Levels: Your horse will achieve and maintain healthier levels of blood sugar. No More Muscle Cramps: Since Himalayan salts help regulate electrolyte balance, muscle cramps from running, jumping, and generally straining are kept to a minimum. Better Blood Pressure: When consumed with water, these salts are essential in regulating blood pressure. Himalayan Horse Salt Lick, 100% natural mineral salt mined from the ancient Himalayan mountains, helps replace lost electrolytes. The rose pink color is a result of the high mineral content of iron, potassium and magnesium, all vital for maintaining good health. Safe for all wildlife, including horses, white tail deer, elk, caribou and more. Features a hole carved through the center to attach 3-1/2″L rope (included) for hanging; no need for a metal holder. Also fits inside horse toys. Weather resistant; ideal for outdoors. Horses deficient in salt will lick or chew on mangers, fences, dirt, rocks and other objects. They also develop depraved appetites, rough hair coat and reduced growth. Mares experience reduced milk production, according to reports from the Mississippi Station. Horses with severe salt deficiency, brought about by a low salt intake and considerable sweating, become fatigued and exhausted. Horses that sweat profusely can lose as much as 82.5 grams of sodium per day. Consequently, level of activity and degree of heat stress has a greater affect on salt requirement in horses than any other farm animal species. The need for salt varies considerably, depending on a horse’s level of work, riding or heat stress. Because sweat contains about 0.7% salt, the more a horse exercises the more salt is lost via sweat and the more it is needed in the diet. We here at Organic Beauty recommend offering Himalayan Salt free choice or by the scoop to your horse and giving the supplement, Provision, to ensure a healthier horse. Position your natural salt licks anywhere at your convenience! Khalid Maqbool & Sons established a line of saline supplements that depicts flexibility in terms of how and where it can be placed. Not only these salt licks can be prepared in the ground, it can also be placed hanging over fences or trees as some pieces were designed with ready to suspend ropes which you can hang at any spot. So whether your pets are inside their stables or outside the field, you can give them the minerals their body need without sacrificing your own comfort. Do not wait for your animals’ mineral levels to deplete before you start acting on it! Start nourishing your animals now! Avail Khalid Maqbool & Sons Himalayan natural salt licks and let your animals flourish with the bursting nutrients of these long-lasting, pure, and organic pieces of untainted Himalayan natural salt licks! For thousands of years it has been known that domestic and wild animals need salt just as man does, and not just for flavor. The virtues of salt for animals were extolled by the ancient Greeks. Early explorers in Africa, Asia and North America recorded observations of grazing animals traveling to salt springs or deposits to satisfy ravenous appetites for salt. Animals deprived of salt will risk grave danger or resort to unusual behavior to obtain it. Considerable evidence exists that early nomads and hunters took advantage of this fact to lure and capture animals by locating areas with salt and waiting for animals to come there periodically. Salt is unique in that animals have a much greater appetite for the sodium and chloride in salt than for other minerals. Because most plants provide insufficient sodium for animal feeding and may lack adequate chloride content, salt supplementation is a critical part of a nutritionally balanced diet for animals. In addition, because animals have a definite appetite for salt, it can be used as a delivery mechanism to ensure adequate intake of less palatable nutrients and as a feed limiter. Even though the body only contains about 0.2% sodium, it is essential for life and is highly regulated. About half of the sodium in the body is in the soft tissues of the body; the other half in bones. Sodium is vital to stock health, it plays a major role in maintaining body fluid balances, transmitting nerve impulses and the uptake of key nutrients from the bloodstream. To maintain good animal health it is essential that salt is provided in the domestic farm environment. The other nutrient in salt, chloride, is also essential for life. Chloride is the primary anion in blood, and represents about two thirds of its acidic ions. The chloride shift, movement of chloride in and out of the red blood cells, is essential in maintaining the acid-base balance of the blood. Chloride is also a necessary part of the hydrochloric acid produced by the stomach which is required to digest most foods. KMS Salt provides minerals that are essential for muscle, nerve and immune system functions, healthy coats and sound reproductive health. Because cattle actually seek out salt, it can be very useful as a carrier for other essential nutrients. Salt is a necessary mineral for cattle, and they need to consume it on a regular basis. Animals have varying mineral requirements depending on their age, stage of reproduction and weather conditions. That’s why there are KMS Salt products, like weather durable cattle salt licks as blocks and bricks, to meet a variety of needs for your herd. The purpose of the animal’s immune system is to render harmless foreign agents which may be bacteria, virus, or non infectious entities such as chemicals or toxins. Trace Mineral deficiencies occur all too frequently. When they do, the animal grows at a reduced rate, uses its feed less efficiently and operates with a depressed immune system. The end result is inefficient production and low profitability. To maximize immune functions, Trace Minerals must be provided on a regular basis. Because many of the Trace Mineral compounds are unpalatable in the pure form, providing a delivery method that ensures the proper intake on a regular basis is essential. Trace Mineral salt has proven to be the safest, most effective delivery method. Salt doesn’t make you thirst – it is a imbalance in the salt/water ratios within your body that makes you thirsty. If you have too much salt, then you will become thirsty and drink water to restore the balance. If you have too much water, your body disposes of the excess water. Too little water is of course harmful. If you have too little salt, then this can also be extremely dangerous. Drinking large amounts of water and sweating in the summer sun can leave you low on salt and if excessive can be fatal. By giving cattle both water, food and salt blocks, they can regulate their intake as per their bodies requirements. KMS animals salt blocks are hard, rock-like manufactured blocks that contain a range of trace elements. They can be scattered around a farm for animals to lick. The blocks are usually mainly salt (sodium chloride), but can also contain calcium, iodine, copper, cobalt, iron, selenium and zinc. Himalayan Salt is a great way to boost efficiency in cows and cattle. Rock Salt encourages saliva flow which, in turn increases the rumen ph.Sodium (Na) is an essential element for animals but is not required by plants.Cattle greatly improved when cows are supplemented with salt. Himalayan cattle salt is an actual source of over 84 minerals and trace elements including Iodine, Calcium, Magnesium, Potassium, Zinc and Selenium that are essential for good health. Himalayan cattle salt are perfect for horses, cattle, lamas, goats and sheep. Convenient & easy to handle – hang in your stall, barn, shed, fence or an a tree. Rock solid and long-lasting – your horses won’t be able to bite it, they just lick. Without salt animals will get sick. Every mammal requires salt. It is actually a necessary nutrient in our diets! Horses and other animals, like humans, lose minerals from their bodies as it is carried out in their sweat…one of the most abundant of these minerals is salt…Horses and other animals often lose lots of salt during very strenuous workouts. So, some owners try to help them replenish the lost salt by providing a salt lick. This helps your horse or animal to regain the lost salt quickly, however there are more reasons. Salt often makes you want to drink, right, so, it’s similar for horses. By having Himalayan Cattle Salt available to your animals, they are also encouraged to drink more water to keep them hydrated! Cattle Salt from 100% Original Himalayan Crystal Salt, hand picked, handcrafted and having the same profound positive effects on your animals that it has been scientifically shown to have on humans. Best cattle salt for farm cattle horse cow sheep and pets. 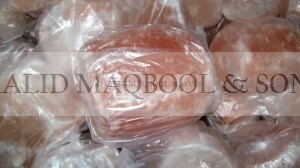 Khalid maqbool & sons are manufacturers and exporter of Himalayan cattle salt for sheep, cattle and other animals in Pakistan,offering best retail and wholesale prices. Our livestock cattle salt are 100 percent natural and purest Himalayan crystal salt for all animals, a unique salt supplements for livestock, horses, cattle, sheep, camels and all pet animals. Each cattle salt comes ready with a handy rope to allow it to be hung on a gate,fence, trough or tree. The distinctive rose pink color comes from the salt’s high mineral content, including iron, potassium, and magnesium, which are all vital for maintaining health. Mass-produced salt licks are produced using salt with minerals added in during the manufacturing process, but that’s not the case with Himalayan salt, where the minerals are naturally found within the salt. Himalayan rock salt licks are literally “rock hard,” meaning that horses and ponies are unable to bite chunks off the block, a problem than can occur with softer “pressed” salt licks. These licks are also more weather resistant, which means they can be safely left outside in the field for horses to “self-dose.”Our experience has show that horses do prefer these to other salt licks. HOW TO USE LICK SALT? Lick salt can be hung anywhere you wish – on a padlock fence, outside or in. You can hang one in your horse’s stall and one on his favorite tree out in the pasture. Not to mention, these beautiful, mysterious salt licks look more like decorative crystals than a food source for your horse! They will add a hint of glitz and glamour to any stall or yard. But, if you hang a salt lick outside, you may be concerned about the elements – rain, wind, and snow. Have no fear: Himalayan salts are naturally weather resistant, making them hold up in even the roughest weather. The lick won’t dissolve in the rain or turn to mush in wet weather. Without salt, animals could get sick. Every mammal requires salt. It is actually a necessary nutrient in our diets! Horses and other animals, like humans, lose minerals from their bodies as it is carried out in their sweat…one of the most abundant of these minerals is salt…Horses and other animals often lose lots of salt during very strenuous workouts. So, some owners try to help them replenish the lost salt by providing a salt lick. This helps your horse or animal to regain the lost salt quickly, however there are more reasons. Salt often makes you want to drink, right, so, it’s similar for horses. By having Salt Licks, Biotin and Vitamin E enriched mineral blocks available to your animals, they are also encouraged to drink more water to keep them hydrated! Calcium promotes muscle strength and nourishes the bones, leading to stronger and healthier bones, joints, teeth, and hooves. The minerals found in Himalayan salt help to reduce the kidney’s workload by reducing water retention. It helps maintain a healthy pH balance on a cellular level. Magnesium is particularly good for your active horse, providing relief for tired and aching muscles. Potassium is essential for a strong heart. Iron keeps the blood healthy. If a horse has been starved of salt or had a reduced intake for a prolonged period of time, it is best to control the amount of salt it gets until its craving for salt stabilizes, too much salt can leave your horse with an upset stomach along with other health issues.